All transactions are safe and secure with a reliable history in online purchasing behind each of our associates. 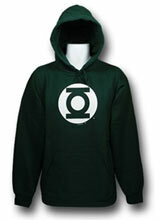 Buy the Green Lantern Hoodies to own Green Lantern clothing and merchandise. This logo Green Lantern hoodie is an ideal addition to any DC comic book fan's collection. Not only does this clothing item keep superhero fans warm in inclement weather when a logo tee isn't practical, it also works as a costume. Wear it with your favorite Green Lantern movie shirt for the perfect combination. For more galactic fun, check out the Green Lantern action figures and toys below. Don't miss the replica rings that will help you when you're taking on Sinestro and the bad guys. In addition to the Green Lantern Hoodies above, browse the Green Lantern Clothing Gallery for more apparel like men's and women's clothes, kids shirts or hoodies.